Financial advisors aren’t typically familiar with search engine optimization (SEO) strategies. Because SEO is complex, many advisors ignore the potential benefits completely. But after working with over 50 advisors to optimize their websites, we have seen some powerful results with a few small changes. Especially for advisors with a specific niche, it pays to focus on showing up for specific keyword searches. SEO results are driven by supply and demand. Keywords like “financial advisor” and “financial planning” can be competitive in large metropolitan areas. But if you operate in a smaller location or have a unique specialty, SEO can make a huge difference in the visibility of your site. The first thing we did was take a “before” snapshot to see how his site was currently ranking for those keywords. He hadn’t done any SEO work on his site, so he was not showing up in the top 100 search results. After our SEO Package, the results were impressive! He was showing up as the top search result for Business Longevity Advisor Clearfield UT! For the second and third keywords, he was showing up as the #6 result. This is powerful, since he does not have to pay per click for traffic generated to his website from organic keyword searches. The results will continue to pay dividends for months and years into the future with no ongoing costs. It’s critical to set up and optimize your Google My Business page to tell search engines who you are, what you do, and who you serve. Google requires that you verify your business via U.S. Mail. Your verified Google My Business page will list your business category, link to your website, and display your photos. 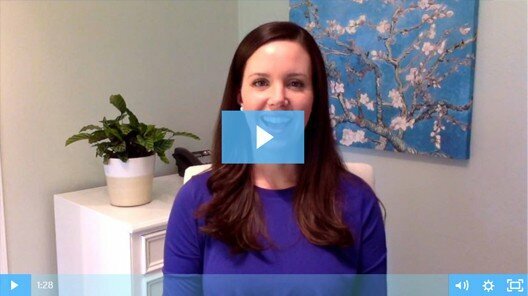 This is the single most important action you can take to improve your website’s SEO. The second thing search engines look for is a website that lists relevant keywords. 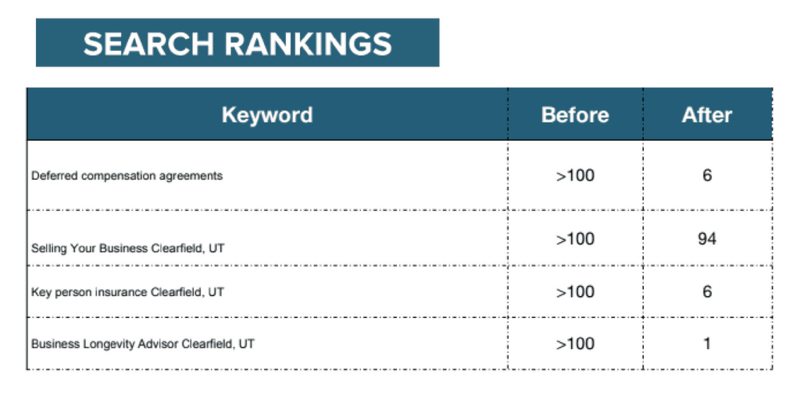 You’ll want to update your site with the keywords you wish to rank for. Use best practices for the keywords you are targeting, like optimizing your headings, images, and blog posts for the same set of keywords. The third verification search engines like to see is a large set of citations that list your business name, address, phone number, and business category. Be sure to use the exact same data for each listing you create. By building citations for your business with online listings, you can create a strong signal to search engines. Try for at least a dozen; our SEO Package creates 20 local citations for your firm. Haphazard citation creation can be unhelpful or even harmful to your rankings. We follow a strict protocol for making sure citations are built to specifications and help drive your business higher in results. By updating these three items, you can make a significant impact on your search rankings. Of course, results will vary based on the competitiveness of the terms. Adding your location for the search term will improve your results. The more you can focus your services and specialty, the easier it is to rank at the top of search results. Spend some time thinking about what you do best and who you most enjoy serving. Then, consider the keywords these prospects might type into Google to find help. Make a list of relevant keywords and optimize your Google My Business profile, website, and citations for those terms. If you’d like to learn more about how to optimize your website’s SEO, read our Ultimate Guide to Search Engine Optimization for Financial Advisors. If you need help with your SEO, you can save $100 on our SEO Package here. Register for our exclusive webinar below to learn more. Previous Post: « How Is an Advisory Firm Founded in 2013 Raking in Over $4 Million in Revenue Each Year?